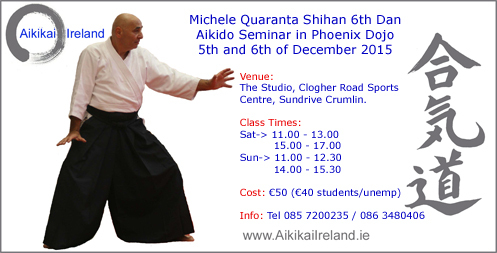 Aikikai Ireland Technical Adviser Michele Quaranta Shihan will give his first seminar in the Phoenix Dojo Dublin. Aikikai Irelands Phoenix Dojo will host an East coast seminar where Joe McHugh Sensei 4th Dan and Trevor Pigott Sensei 4th Dan will teach at the saminar eligible Aikikai Ireland students will have the chance to grade. The Studio, Clogher Raod Sports & Community Centre, Sundrive Crumlin. 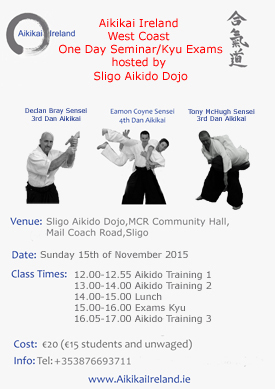 Aikikai Ireland's Sligo Aikido Dojo will host an West coast seminar where Eamon Coyne Sensei 4th Dan, Declan Bray Sensei 3rd Dan and Tony McHugh Sensei 3rd Dan will teach at the seminar eligible Aikikai Ireland students will have the chance to grade. MCR Hall, Mail Coach Road, Sligo. 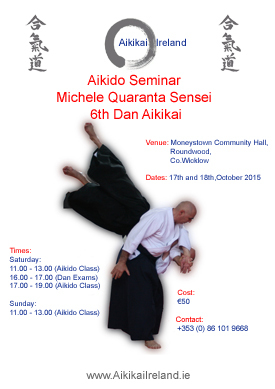 Aikikai Ireland Technical Adviser Michele Quaranta Shihan 6th Dan will give another Aikido seminar in Moneystown Community Hall, Wicklow on the 17th and 18th of October. 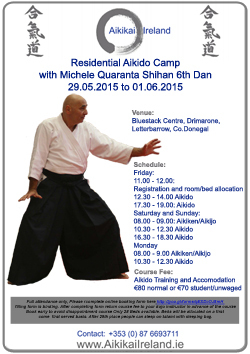 This will be third of seminars of 2015 with Michele Shihan. Michele and Joe headed to USA!!! 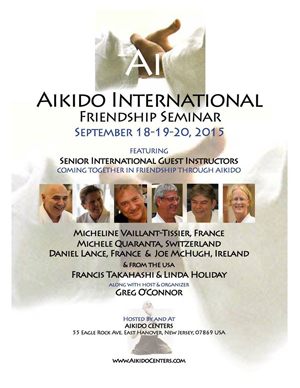 Aikikai Ireland Technical Adviser Michele Quaranta Shihan and Ikeda Dojo Wicklow instructor Joe McHugh Sensei are headed across the pond to the USA for an international Aikido Friendship Seminar on the September 18th,19th and 20th. 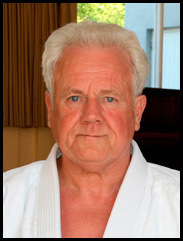 Greg O'Connor is the course coordinator and founder of the host dojo Aikido Centers in New Jersey. 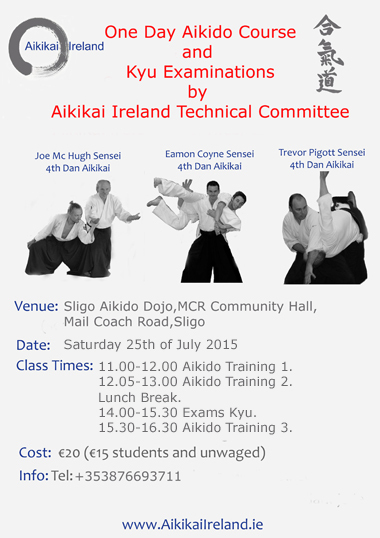 On Saturday 25th of July the Aikikai Ireland Technical Committee Members Joe McHugh Sensei, Trevor Pigott Sensei and Eamon Coyne Sensei will give a seminar in Sligo Aikido Dojo. 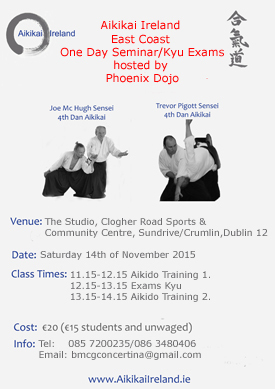 At the seminar eligible students from around the Aikikai Ireland dojos will have the chance to grade. MCR Community Centre, Mail Coach Road, Sligo. 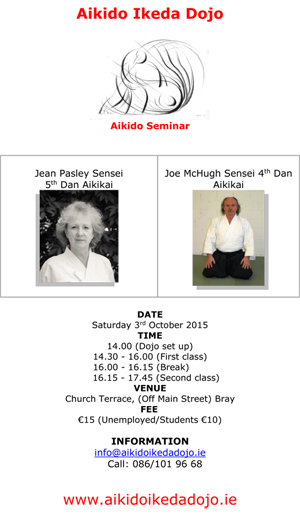 On Saturday 25th of April an Aikido Seminar will be hosted in Aikikai Rathmines by host instructor Jean Pasley Sensei 5th Dan and Joe McHugh Sensei 5th Dan. This will be the first time that both instructors will have a seminar together and promises to be a good days training. 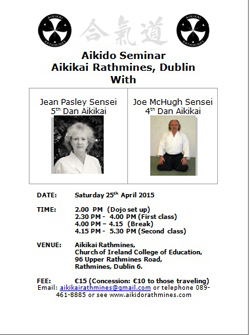 Aikikai Rathmines,Church of Ireland College of Education, 96 Upper Rathmines Road, Rathmines, Dublin 6. 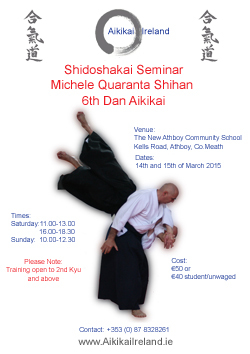 The first of the 2015 seminars with Aikikai Ireland Technical Adviser Michele Quaranta Shihan will take place in Athboy on the 14th and 15th of March 2015. the seminar will be Shidoshakai Yudansha training and will be open to students of 2nd Kyu and above. 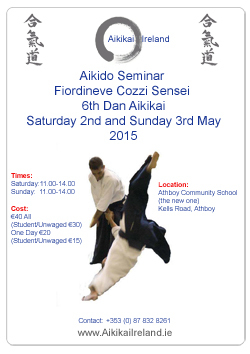 Athboy Aikido Club will host the course, it's been a little while since we had a course in Athboy so everyone is looking forward to getting back up to train there.